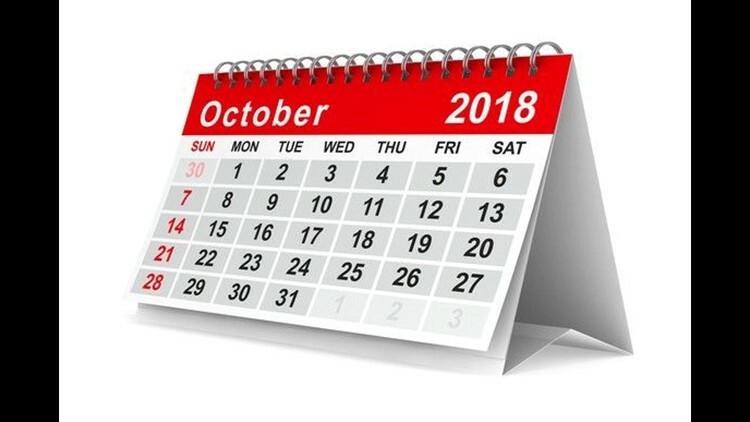 An October 2018 calendar standing on a surface. October is about more than ghosts, goblins and candy. It's also about pizza, pasta, dessert, cookies and more. It's National Pizza Month, National Pasta Month, National Cookie Month along with National Financial Planning Month. The two biggest days of the month are National Taco Day on Thursday, Oct. 4 and Halloween. We had sweet savings Oct. 14 for National Dessert Day, and Oct. 17 is another carb day with National Pasta Day. Bookmark this page because it'll be updated frequently with additional deals. More: Halloween food deals offer freaky freebies, spooky specials. Here's where to find them. 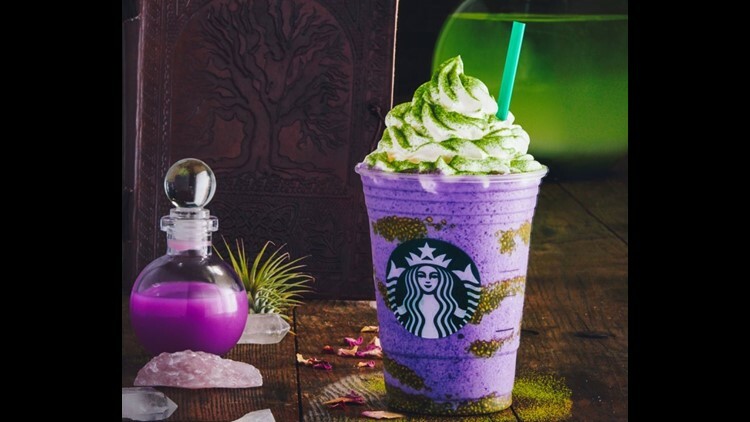 Starbucks has a new Halloween drink, the Witch's Brew Frappuccino. BJ’s Restaurant & Brewhouse: Through Halloween, the chain's Pizookie dessert will be $3 each, which is more than half off the regular price. No minimum purchase is required. New members of the chain's rewards program get a coupon for a free Pizookie for signing up www.bjsrestaurants.com. Cheesecake Factory: Not a National Chocolate Day deal, but Monday through Wednesday, place a $30 or more Cheesecake Factory delivery order through DoorDash and get a free slice of Reese’s Peanut Butter Chocolate Cake Cheesecake or Hershey’s Chocolate Bar Cheesecake with promo code TREATORTREAT. Coco's Bakery: Through Oct. 31, the West Coast chain has a pie sale going on with prices ranging from $9.99 to $10.99. Join the chain's eClub for a free slice. Hershey’s Store: Through Halloween, save 40 percent off glow in the dark and bulk Halloween candy at www.hersheysstore.com with code HALLOWEEN40. Or join the email list to save 10 percent off your first order. Lake Champlain Chocolates: Through Halloween, save 20 percent on purchases $75 or more at www.lakechamplainchocolates.com. Cannot be combined with other discounts or promotions. Mrs. Fields: For National Cookie Month, get 15 percent off online orders through Oct. 31 with promo code COOKIE. My M&Ms: Through 11:59 p.m. PT Tuesday, get 25 percent off sitewide at www.mymms.com with code CHOCOLATE25. No minimum purchase required, but excludes NFL, MLB, clearance and sale items. IHOP isn’t wasting any time in spreading Christmas cheer. 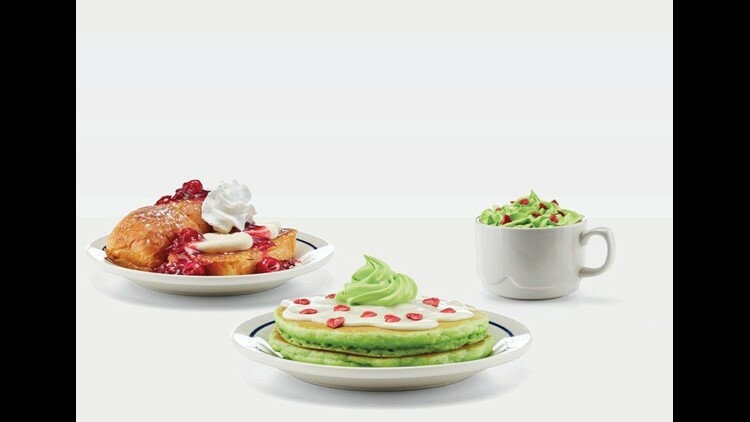 IHOP has a special Grinch menu through Dec. 31, complete with green pancakes. Applebee’s: The October Neighborhood Drink of the Month is the Dollar Zombie, an electric-blue-colored drink topped with a gummy brain for $1. Baskin-Robbins: Small Cappuccino Blasts are $2.99 in October. BJ’s Restaurant & Brewhouse: Through Halloween, the chain's Pizookie dessert will be $3 each, which is more than half off the regular price. No minimum purchase is required. New members of the chain's rewards program also get a coupon for a free Pizookie for signing up www.bjsrestaurants.com. Chili’s: The Great Pumpkin is the $5 margarita of the month. The chain said it's made with Monin Pumpkin Spice Syrup, Lunazul Silver Tequila, Triple Sec and a splash of Captain Morgan. DoorDash: For a limited time, sign up for a week trial of the new DashPass subscription. With the trial, get unlimited free delivery on orders of $15 or more. The free trial can be activated at in the DoorDash app or online at www.doordash.com and no promo code is needed. Grubhub/Seamless: Now through Nov. 5, the food delivery services and Venmo are offering college students $10 off any order $15 or more. Visit http://lp.grubhub.com/campus/venmo or https://lp.seamless.com/campus/venmo/ and enter your .edu email in the field. Each college student will receive a unique promotional code that’s automatically applied at checkout when they pay using Venmo on the Grubhub or Seamless app. Jack in the Box: Through Dec. 10, get two croissants for $4 when you sign up for a coupon at www.jackinthebox.com/offers. Panda Express: In honor of the chain's 35th anniversary, through Oct. 31, get $3 off any online order $5 or more with the code HONEYISBACK. Set your sights on this Sweeter Carolina. This mighty delicious twist on the Sweet Carolina is a part of our #NationalPulledPorkDay celebration on 10/12. Sonny's BBQ: Through Nov. 4 as part of its National Pulled Pork Day festivities, Sonny’s has limited-time-only pulled pork creations including the Pork ‘N Donut, which is pulled pork on top of a “Signature Sweet Tea-glazed donut drizzled with Sonny’s Sweet Sauce.” Also through Nov. 4, enter the Mobile VIP Club Pork Contest for a chance to win free pulled pork for a year by joining the club by texting PORK to 73165. Taco Bell: Through Nov. 8, Taco Bell is offering first-time app and online order customers 20 percent off an order, up to $10 off. The 20 percent coupon will expire two weeks after signing up. Learn more at www.tacobell.com. The Lost Cajun: Through Oct. 31, get half-price cups, bowls and quarts to go.